Nail Fungus Infection - Nail Fungus Treatment: Discover the Best. 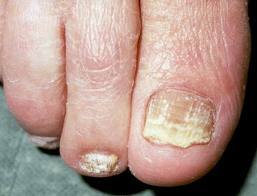 Fungus infections of the nails, the great toe, can be caused by a number of different pathogens. One of the most uncommon (get ready for the big words) is a nondermatophyte mold. We won’t go into the name of the three most common molds, it isn’t necessary to know. The above mentioned type of mold, and there are molds everywhere, is important as it is found mainly in soil and decaying plant material. This is a very rare type of fungus infection. The ability to actually diagnosis this is important as nail infections are difficult to treat and even harder to cure. Diagnosis is made by microscopic findings of a nail scrapping. Therefore it may be necessary to consult with a podiatrist for a definite diagnosis. Mold type fungus infections can be acquired the same way as others. Wet floors of communal showers in gyms and locker are notorious for this type of contact. It is easy to obtain a fungus infection. Fungus is commonly found on our nails so any small opening of our skin is an invitation for the fungus to take up residence in our toe. This also is applicable when it comes to any type of injury to the foot and or toes. The infection may remain dormant for a period of time before it comes apparent. 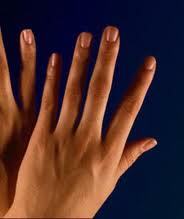 The first symptom will be a discoloration or dot on the tip of the finger. This will quickly change to an unhealthy looking nail, discolored, oddly shaped and crumbly. As the fungus takes hold it will deposit material under the nail and if there is enough of it the nail may separate from the nail bed. If you are one of the unfortunate ones that need to wear heavy construction boots the pressure from these shoes will aggravate the infection and increase the pain. This is a long term infection and if you suffer from any other chronic illness you may find it twice as hard to achieve a complete cure. Obesity sets up the problem of being able to reach your feet to give them the care they need. Chronic illness as in diabetes often reduces our eye sight and perhaps we will not notice the onset of the infection. For both of these groups perhaps professional foot care would be a good alternative than trying to do it yourself.